This will be more confession than review. We had just left Al’s and our stroll to Gino’s was quicker than expected, so we lollygagged around the area and Steph caught sight of Xoco. I remember a Top Chef Master's transformative introduction to authentic Mexican cuisine. Steph remembers chocolate. So between our two lunches…we had a lunch snack. 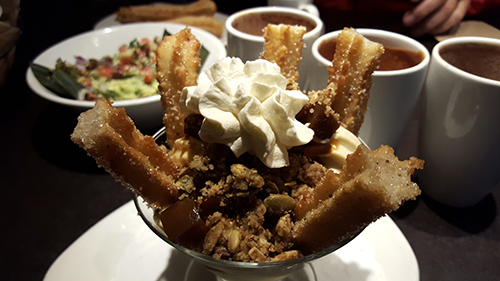 It was just going to be a cup of hot chocolate, it turned into all of their hot chocolates, churros and chocolate, a churro sundae (not the same as churros and chocolate) and guac. Judge all you want, I regret zero. 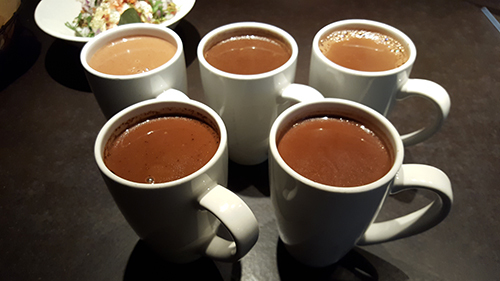 We ended up with five cups of fresh ground bean to cup chocolate. Easily the most simple but intense chocolate I’ve ever had is here. 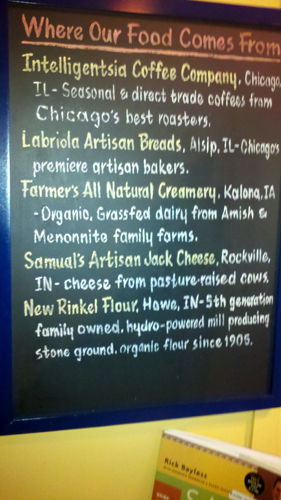 Our least favorite was unanimously the Almendrado with the almond milk…didn’t really need the almond at all. I think the Classic with chocolate and milk was next to fall and then opinions started to spread on personal taste. Needless to say…anyone of the five would make Milton Hershey, Frank Mars, and Willy Wonka blush. Water instead of milk added an nice extra bitterness to the Authentic. The Aztec benefited from dashes of chile and allspice. My favorite was the Mexico City Thick. Thick is apt. Where I thicken hot chocolate with heavy cream this stuff is I think just water and chocolate that has “champurrado” added. I had to look it up. Apparently a drink thickened with corn masa. Ok. What really made it stand out was the sincere tang that came out of nowhere. If you are a fan of goat cheese, or sour cream and would also like to be kicked in the teeth by chocolate…this is for you. 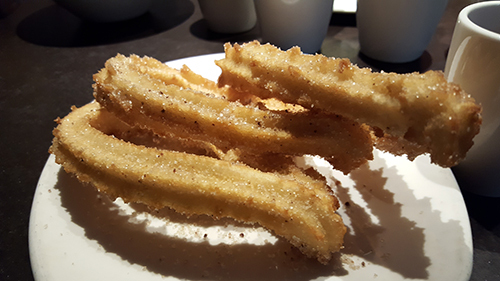 The crunchy fried churros were dusted with cinnamon sugar and the first was served with a cup of chocolate…I had a caffeine buzz two step from flying by the time we left. 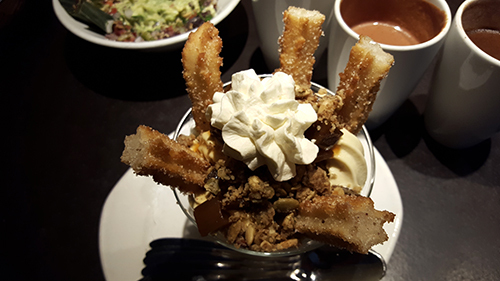 The second set of star shaped ropes of doughnuts were standing in a soft serve pumpkin ice cream with calabaza en tacha (candied pumpkin), pumpkin seed streusel and whipped sour crema. The sour really elevated the sweetness of the rest of the dish…again…regretting nothing. 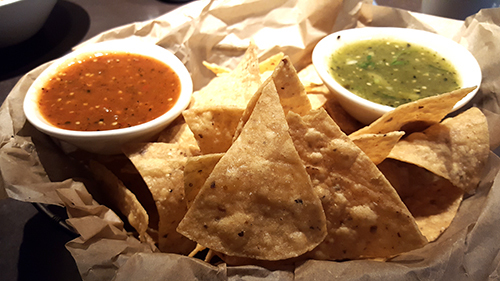 The quac was studded with roasted garlic and tomatillo and served alongside a three chile and a tomatillo salsa and perfect chips. 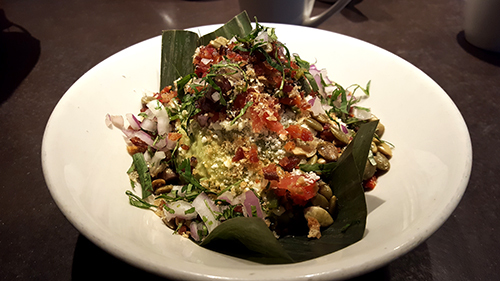 We got the guac fully dressed which means it was crowned with a plethora of awesome…namely, spicy roasted poblano, chicharron (crispy fried pork skin), grilled onion, local MightyVine tomato, queso fresco (fresh cheese), pumpkin seeds, and smoky bacon. Extravagant and gorgeous. If we get to Alinea tonight, Topolobampo might just HAVE to be on the horizon. All hail Rick Bayless and chocolate. My cousin Lori asked if we were going to Xoco during our eating adventure. 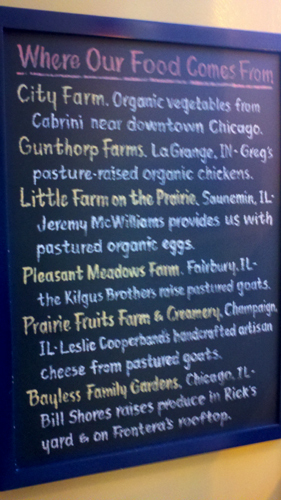 I had completely forgotten about the Mecca of Mexican cuisine established by Rick Bayless in Chicago. High end locations Tompolobompo and Frontera Grill are well regarded. 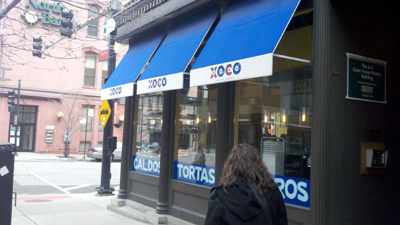 More recently he opened a place called Xoco which is Aztec slang for little sister. 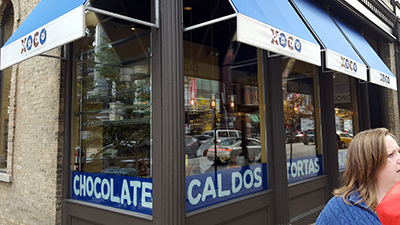 Located right around the corner from the other joints on Clark, Xoco pays homage to Mexican street food, and the menu looks outstanding. It’s difficult to understand the service until someone explains it to you, but it makes sense once you see it work. There is a line that looks like you should be waiting for 10 minutes but they tell you the wait is 30-45 minutes since you don’t order until there is a spot for you to sit down. It worked just like intended. 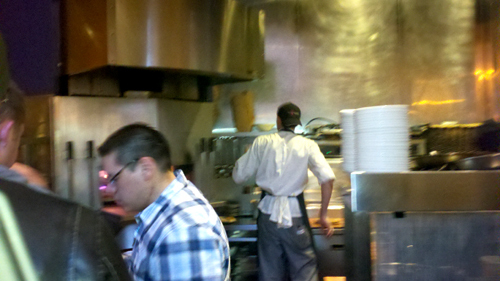 Plus standing in line watching the kitchen work and smelling the aromas certainly ups sales. It’s a pretty small place, brightly colored and loud, filled with people making very happy faces. It was going to be difficult deciding what to limit our order to…they offer mostly tortas (sandwiches) and caldos (meals in a bowl…soup with stuff). The problem is the number of options under each and they all sound so distinctive and sumptuous. Once we got to the line we knew what we were going to get. 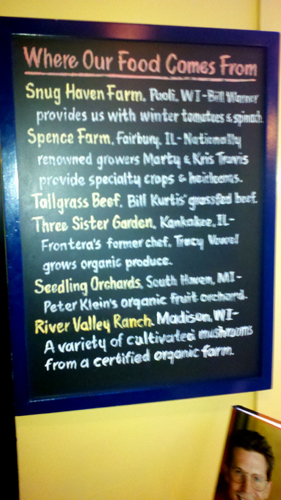 It had changed at the last minute when we saw the chalk board with the nightly special. 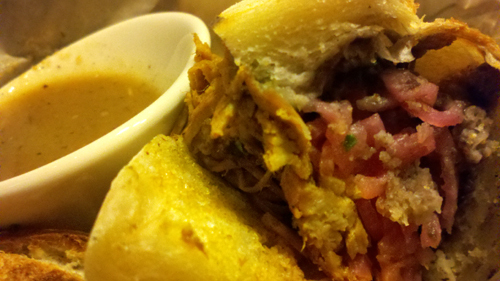 We started with chips and salsa, the seafood caldos, the torta pibil, the goat barbacoa torta, and churros. 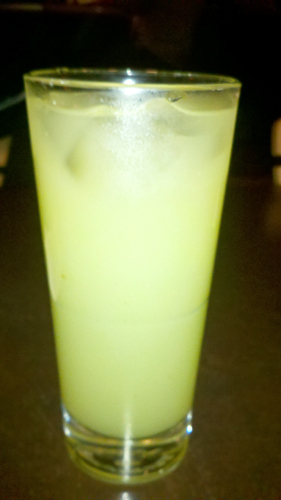 I ordered a vile looking green concoction called Agua del dia. Cucumber, mint and lime infused into the water was one of the brightest and most refreshing drinks I have ever had. I don’t care much for lemonade…I find it sticky in my throat which makes me more thirsty. This stuff was everything lemonade wants to be, the Grand Pooh-Bah of AAAAhhhhhhhhh! The chips came quickly and were much thicker than most you will see, resulting in a more serious crunch and more flavor. Imagine a lighter Fritoey corn taste. 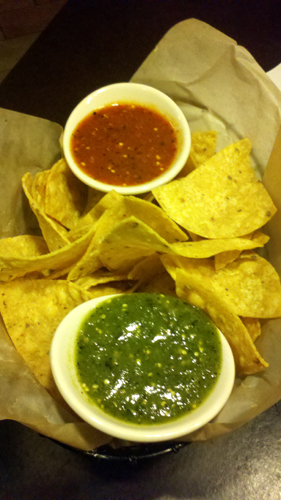 The tomatillo salsa was reeking of lime and was stupendous; while the 3-chile salsa was light with just a little kick. The chips were gone in short order. Next came the bowl and two baskets. 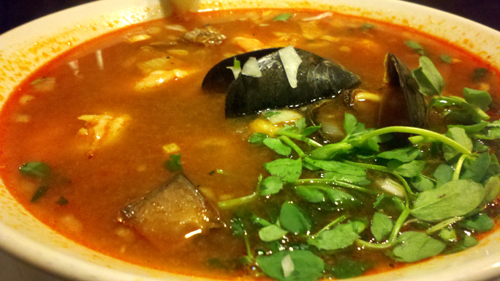 The red chile broth in the bowl was full of sweet seafood flavor and had a light smack of pepper. The broth suspended shrimp, mussels, catfish, potatoes, grilled knob onions, pea shoots, cilantro, and lime. 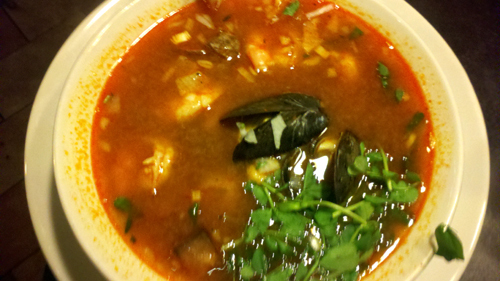 The seafood was tender and nothing was overpowered by the chile. The potatoes were underdone…I think on purpose. They had serious texture and a nearly raw flavor in the broth which I actually minded much less than I expected after the first bite. The raw starchiness was unique and sort of fit. 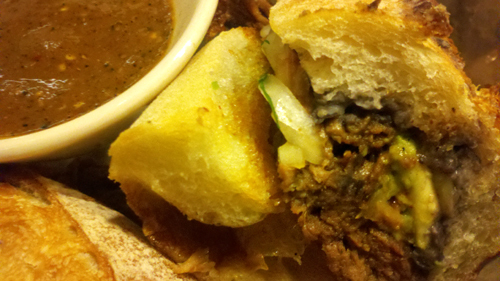 I’m certain the server switched tortas on us…we got what we ordered…we just got the wrong name on each. 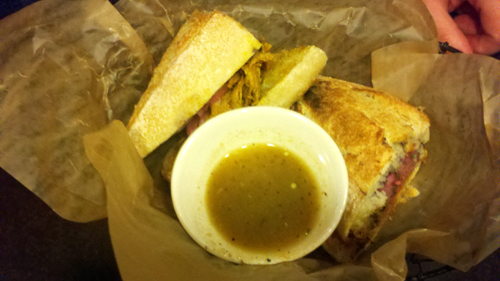 The most telling signal was the sauce alongside the pibil which was a habanero salsa and it was kicking. You wanted to pay close attention to how much you were adding, but you didn’t want to skip it because in the right proportion it made everything else come alive. Superior and exceptionally crunchy bread held wood-roasted suckling pig with achiote, black beans and pickled onion. To be honest with so many flavors (particularly on the meat) it was hard to tell the difference in the meats alone. Well spiced, tender, rich…I thought goat would stand out all by itself but it is well treated here. 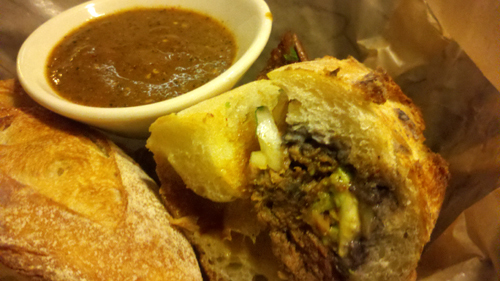 It came with Oaxacan passilla-tomato salsa, avocado, onions and cilantro. If I were superman and could have…without exploding…I would have ordered all the rest, just to see. Distinctively Delicious! Lastly we let the server know we were ready for the final onslaught…bring on the chocolate. There is someone grinding the stuff right behind the counter for drinks and desserts. 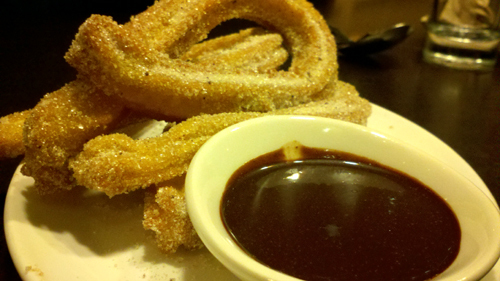 Our churros (funky Mexican doughnuts) came covered with cinnamon sugar and a little cup of chocolate for dipping. 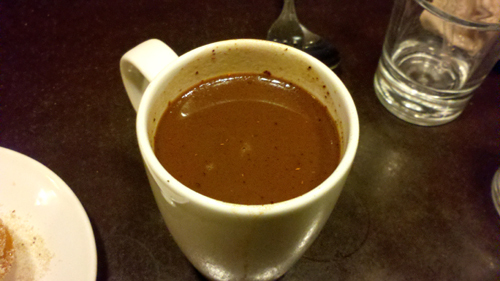 Steph had ordered the Aztec chocolate drink which consists of fresh-ground chocolate, water, chile and allspice. 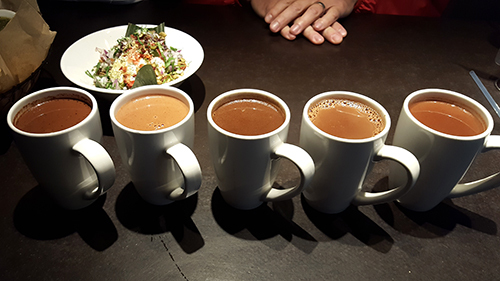 The beverage had very little sweetness and the chile and allspice were strong components of the profile but what was left sitting on your tongue was just serious, hefty, daunting chocolate. 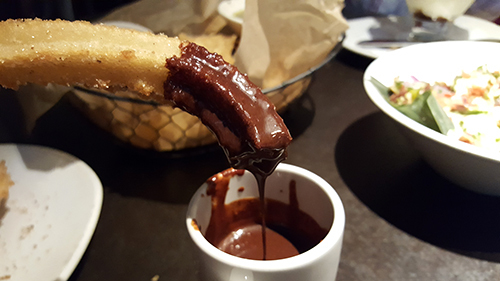 The bowl of chocolate sauce was also unsweetened but when paired with the cinnamon sugar of the crunchy doughnut…Oh Lordy!!! Again you are left with such a slightly sweet but super intense chocolate assault you just can’t stop dipping. I’m so glad we made it to Xoco and got to sample some of Rick’s genius. Reminded me of our Vegas sampling of another Rick from Top Chef Masters. They are labeled Masters for a reason. We shared a table with another couple and chatted pleasantly…then the food hit the table…we never spoke again…it was mutual. The couple of shared looks as we dove in said it all! We shared a non-verbal experience…punctuated with chewing, Oooohs and Aaaaaahs. I consider them friends. Go to Xoco!!! !